Epistar showcased for the first time LED chips for projectors at Taiwan International Lighting Show 2015 (TILS 2015) that took place in Taipei, Taiwan recently. The LED chips provided could be applied in portable projectors, officially marking the company entry into the projector market. The company had developed the chips for several years, before commercializing the product and supplying it for client applications. Epistar made an optimistic outlook for the projector market potential growth and advantages. The projector market reached 80 million projectors in 2014, and its Compound Annual Growth Rate (CAGR) is expected to grow 30% to 40% this year. Small LED projector market has been growing at a rate of 8 million to 10 million per year. Projectors that use LEDs as a light source are much smaller, thinner and easier to carry than conventional projectors. Most projectors use Digital Light Processing (DLP) technology, where light passes through a color wheel consisting of red, green and blue (RGB) optic components before being reflected on a semiconductor chip known as Digital Micro-mirror Device (DMD). The projector lens then projects the final image. Projector white light sources are usually combined from RGB primary colors. In general, the RGB ratio is 3:6:1, but this is not always the case. The ratio is often adjusted according to different client optic design demands. Epistar releases two portable projectors that are 500 lm and 700 lm. Optic designs need to focus on both brightness and spread, a property of light in an optical system that is characterized by how "spread out" the light is in area and angle. For projectors with high brightness requirements, Epistar professional LED chip technology can customize the lighting area to improve the spread lighting. Another design used is high current density designs, which allows the products to operate under high electric currents and brightness. Epistar LED lumen output can reach 300 lm for a single-chip package 1.1x 1.63 mm, and for two-in-one LED chip package that is 2.3 x 1.63 mm 600 lumens. Epistar is currently developing LED chip that can reach light emission of 1,000 lm. Epistar has been the sole supplier of red LEDs using P-side up patented technology. Compared to N-side up LEDs, these LEDs brightness is about 20% higher, and is the brightest red LED on the market. This provides specific advantages for high brightness projectors. 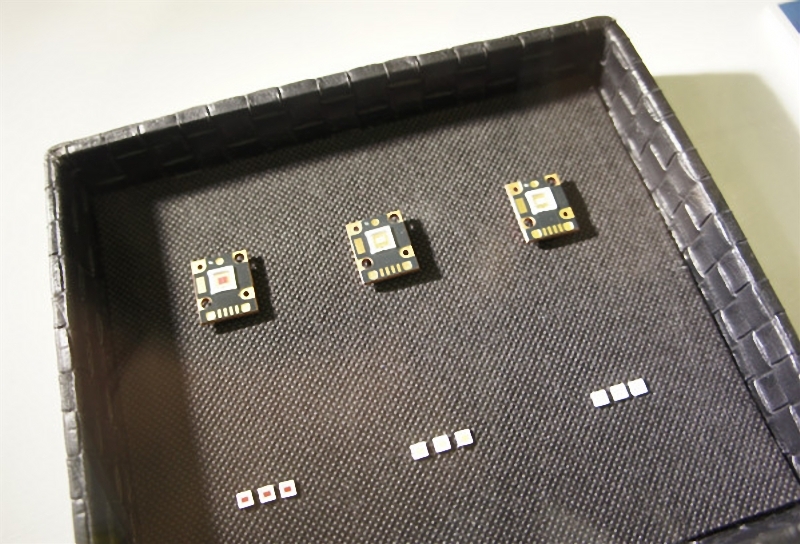 In addition, Epistar LED chips that covers wavelengths ranging from ultraviolet (UV) to infrared (IR) on the spectrum. These LED chips can meet projectors RGB primary color optic design demands. Epistar has been promoting co-activation service models with clients, which uses virtual vertical integration supply partnership to shorten the period required for the client to bring the product onto the market. 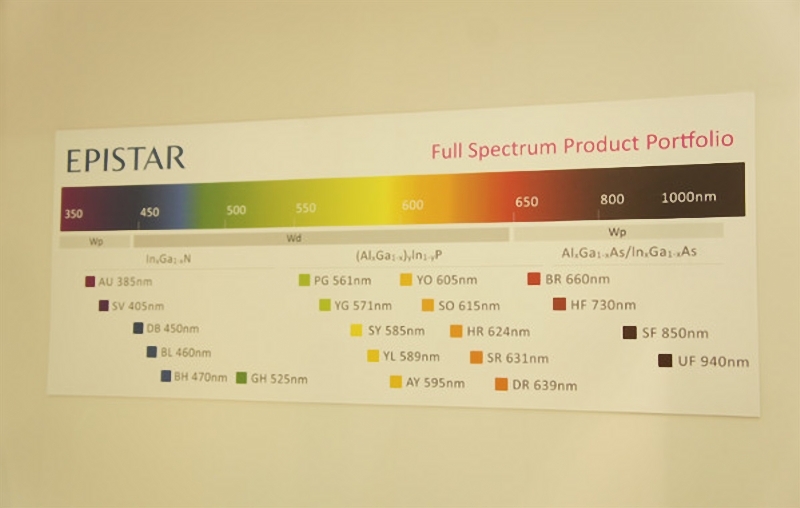 Epistar full spectrum product portfolio. Other projection technologies include smart glasses, such as Google Glass, head-mounted display, head up display, gesture device SixthSense and others. Future projector applications might be similar to those used by Tony Stark in "Iron Man," where people can draw out files with hand gestures, or interact via 3D holographic images. The potential of projectors is highly anticipated.